Back cover blurb: 'O felt her presence behind him like a fire at his back.' Arriving at his fourth school in six years, diplomat’s son Osei Kokote knows he needs an ally if he is to survive his first day – so he’s lucky to hit it off with Dee, the most popular girl in school. But one student can’t stand to witness this budding relationship: Ian decides to destroy the friendship between the black boy and the golden girl. By the end of the day, the school and its key players – teachers and pupils alike – will never be the same again. The tragedy of Othello is transposed to a 1970s suburban Washington schoolyard, where kids fall in and out of love with each other before lunchtime, and practise a casual racism picked up from their parents and teachers. Watching over the shoulders of four 11-year-olds – Osei, Dee, Ian and his reluctant ‘girlfriend’ Mimi – Tracy Chevalier's powerful drama of friends torn apart by jealousy, bullying and betrayal will leave you reeling. Osei or 'O' is the new boy of the title. His care is entrusted to 'Dee', a sensible, smart and popular student. Osei is the first black child that the school has seen. Osei's colour doesn't bother Dee. She is perhaps more forward thinking than her friends, and maybe doesn't truly see his skin colour. Dee however does see Osei in a positive light, and is almost instantly attracted to him. Ian, is your standard playground bully. He is instantly way of Osei, and not just because of his colour. Some of the kids seem to genuinely warm to Osei and Ian worries that he is going to become more popular than he is, or at the very least take the playground attention away from him. Ian's fears become reality as Osei proves himself to be a brilliant sportsman. Ian quickly becomes obsessed with bringing Osei down or ensuring that he leaves the school completely. Meanwhile Dee is becoming obsessed with Osei for altogether different reasons. She is feeling a deep attraction towards him that she has never experienced before with a boy. She knows her Mother won't approve, but she doesn't care. Osei is attracted to Dee too, but Ian tries to warn Osei off her. Not because he is interested in Dee, but why should the new boy be allowed to have the pick of any girl he wants? Especially when she is white? Ian's obsession takes on a more sinister tone when he enlists the help of his ex-girlfriend to try and turn Dee against Osei. When it becomes clear that neither will turn against the other, Ian is forced to take matters in to his own hands - with devastating consequences. 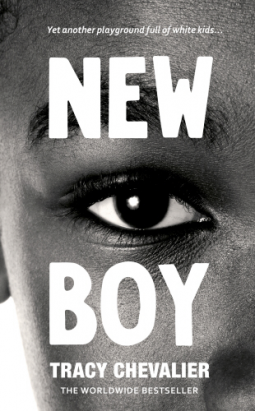 New Boy is available now via Amazon online and all good book shops.